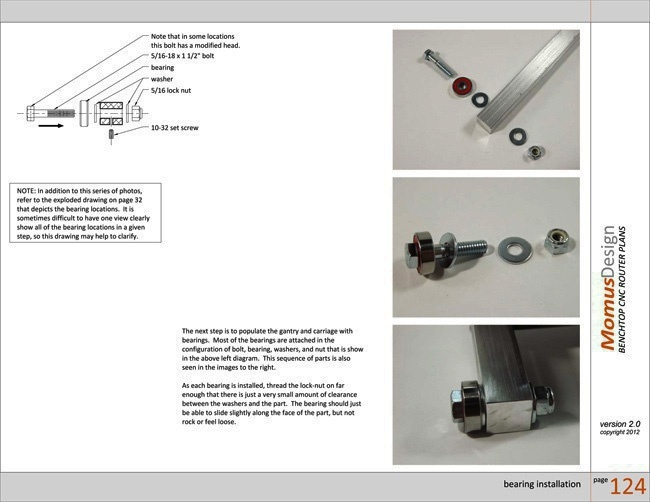 The Momus CNC construction manual covers the complete fabrication and assembly of the machine that is shown throughout this website, as well as a range of related information. 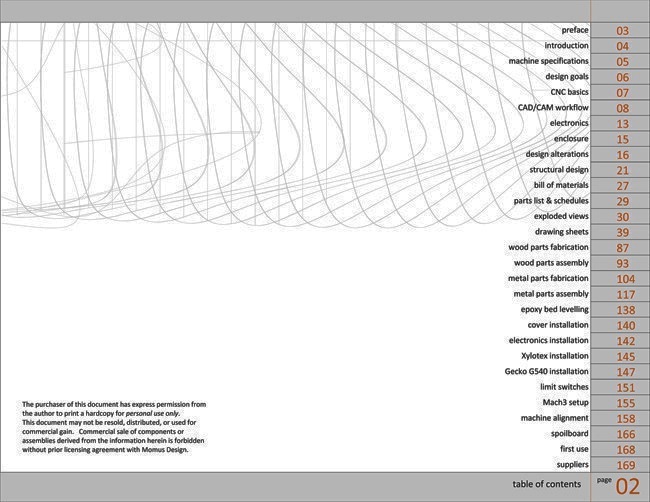 The image to the right shows the table of contents and the extensive quantity of information contained within the manual, from basic information on CNC principles, part drawings, assembly of the machine, to lists of material and software suppliers. 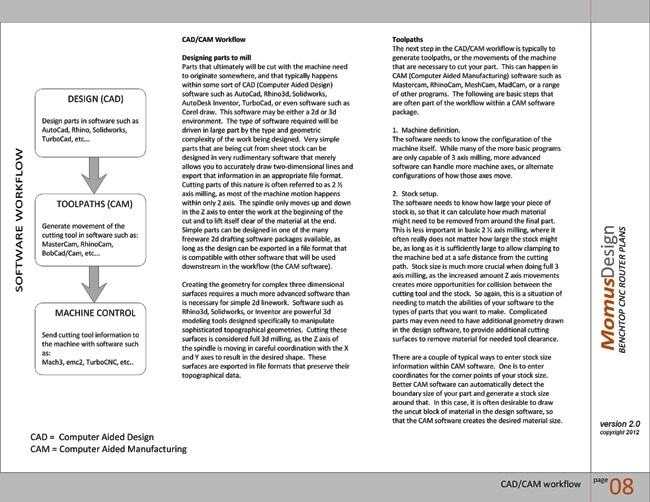 In addition to complete information required to build the machine, the construction manual contains auxiliary information such as basic principles of CAM (Computer Aided Manufacturing) software, and other knowledge which will be helpful for the operation of the finished machine. Exploded-view drawings show the assembly and part relationships of all mechanical sub-assemblies. These drawings also provide part names and numbers, which are keyed to orthographic drawings of each individual component. Exploded-view drawings are provide for both the fabricated metal mechanical components, as seen here, as well as the wood base. In addition to these drawings, extensive photographic images illustrate each assembly step. 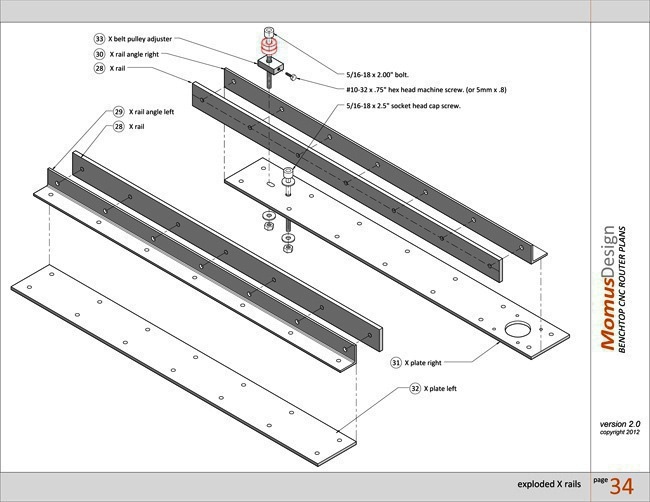 All fabricated components are documented with multi-view orthographic drawings. 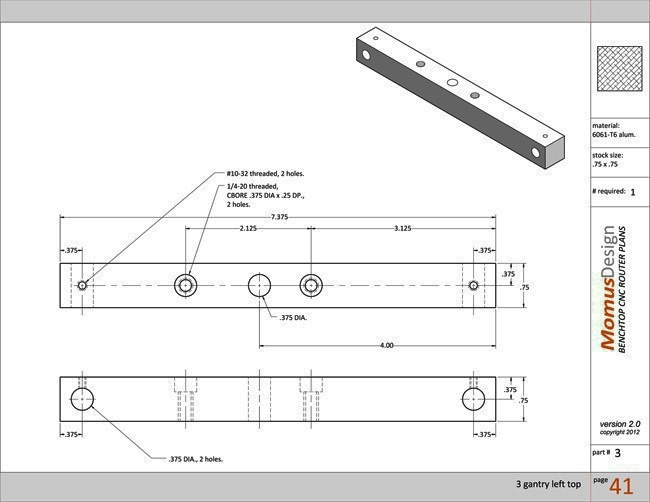 These orthographic drawings are accompanied by a 3d drawing of each part, shown oriented in the position that it will be assembled onto the machine. Each of these drawing sheets also list the quantity required of each part, the material from which it is to be made, and the size of stock from which it is cut. Each step of the machine construction, including the fabrication of parts, their assembly, wiring and installation of electronics, and final mechanical adjustment, is documented with extensive photographs and written descriptions. In addition to these photographs and descriptions, drawings are provided as necessary for even greater clarity. These include both exploded drawings, as seen in the image to the right, as well as wiring diagrams. All current known errors in the plans are listed HERE.